Now that summer is almost here, it is time to start thinking about healthy and tasty snacks to have around the house. Snacks that you can easily pack in a bag for a trip to the park or something you can give to your kids when they come in from hours of playing outside. I had the chance to work with SunRidge Farms and they offer a huge variety of healthy snacks for the entire family. I had the chance to review Fancy Walnuts, Jumbo Pistachios, Tamari Almonds and Whole Supreme Almonds. 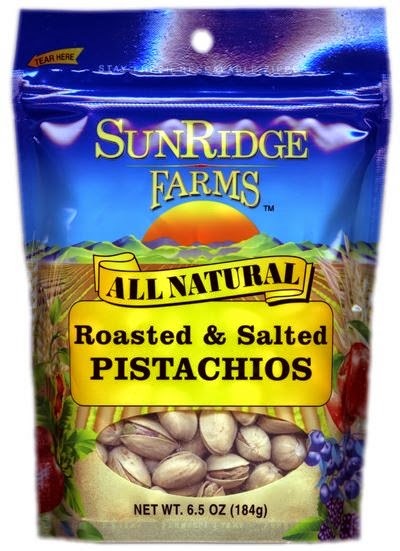 SunRidge Farms is a true innovator in organic and natural bulk and packaged nuts & seeds, dried fruit, candies, and snack & trail mixes. Their commitment to natural ingredient development means nutritional products that are free of unhealthy refined sugars, hydrogenated oils, artificial colorings, and preservatives. Within each of their snack categories they offer a wide variety of naturally flavorful ingredients to satisfy every taste. 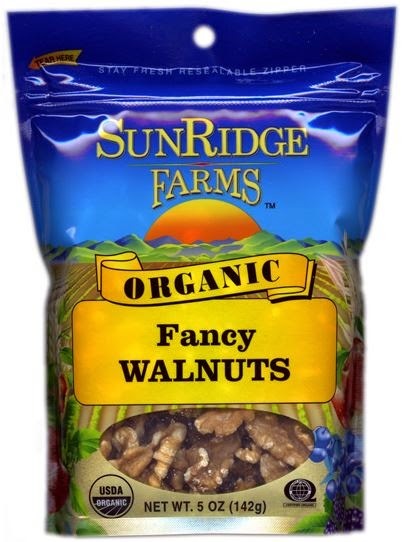 The Organic Fancy Walnuts offer a great taste and a great addition to many baked goods. The walnuts offer a fresh taste as if they have just been cracked out of their shells. When I am baking something that I want to add walnuts to I can simply open the reusable bag, pour the desired amount, and enjoy walnuts in several tasty treats. I also love that I do not have to crack shells anymore to get to enjoy walnuts. The all Natural Jumbo Roasted & Salted Pistachios are amazing. I have just recently tired Pistachios and have become a huge fan of the flavor. The In-Shell Pistachios are perfect for special parties at the house as a nice little snack that everyone is a fan of. I love the roasted flavor with the added flavor of sea salt. Before you know it this whole bag is gone. However, if you can drag yourself away from this tasty bag of Pistachios you can use the reusable bag to help keep them fresh and tasty for the next time you want more. 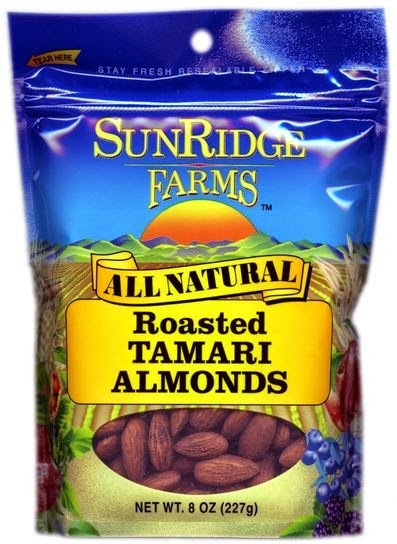 Both the Organic Whole Supreme Almonds and the All Natural Whole Roasted Tamari Almonds are great tasting. In our house, it never fails that we have a basket full of almonds. However, we do purchase them in their shells so we sit around the table, crack almonds, and have nice family talks. However sometimes we just want the almonds without the work to enjoy them. Being able to enjoy almonds in reusable bags already cracked is very nice. Everyone in my family enjoyed both bags of these almonds. Each bag offered a fresh almond taste. The Tamari Almond does offer a nice roasted taste with the tamari shoyu coating while the Supreme Almonds offer the orginal taste of an almond freshly cracked out of its shell. I am happy with each item I had the chance to review. It is also really nice that each product offers a reusable bag. You can show some love by liking Sun Ridge Farms on Facebook. Where to purchase: You are able to make a purchase from the Sun Ridge Farms website. You can also go to the retailers tab to find a store near you to make a purchase.